“They’d have to catch me first,” Scarlett (Perdita Weeks) says near the beginning of this faux-documentary horror outing. She’s talking about the consequences of illegally sneaking into places, or the Catacombs beneath Paris to be more precise. Scarlett is a student studying archaeological formations and symbolic patterns and, having found something called the Rose Key during a dangerous expedition in Iran, she’s now desperate to get her hands on Nicolas Flamel’s philosopher’s stone (apparently nobody at Hogwarts answers the phone). She bands together a ragtag bunch of urban explorers including cameraman Benji (Edwin Hodge) and her reluctant, might-be-mightn’t-be boyfriend George (Ben Feldman) who is still a bit miffed at Scarlett for abandoning him to go relic hunting a while back. Before we get to the scary underground part, there’s a lot of translation gibberish that goes on. Putting her education to good use, our lead scampers around Paris examining odd objects and deciphering hieroglyphic-esque language. It’s an unnecessary history lesson that doesn’t really add anything to the remainder of the movie, nor is it all that interesting. Scarlett, Benji and George dart across museums (maybe it was just one) as the film strives to pick up some early momentum, but it’s a bit wearisome. The dialogue at this point is uninspired too — at one point Scarlett rhetorically asks if she looks like a tourist, trying to emphasise that her self-perceived non-touristy appearance suggests she isn’t up to anything. But she does look like a tourist, and she quite plainly is up to something. This fairly ponderous opening act has much in common with the first half of Bigfoot horror Willow Creek, and much like Bobcat Goldthwait’s film, As Above, So Below kicks into gear when its misguided pawns reach their congested destination. You will die if you run out of light or water in the Catacombs, or if you get hurt, we are informed by the group’s more advanced Catacomb explorers. Heading down into the blackness sounds like a great idea then. Thankfully, this is a horror movie and the characters are all dumb enough to genuinely think descending into dark cavernous ruins is a great idea. All except yep-they’re-definitely-getting-back-together-again George, whose previous claustrophobic endeavours have rendered him resentful of cramped spaces. He spends a lot of time ruling out his involvement, but ends up following the group all the way to the entrance anyway and then, through a bit of hullabaloo, finds himself in another cramped space. The confined setting almost immediately generates a very primitive longing for air among the characters, and we even occasionally get caught up in its uneasy potential. “People who go in this tunnel don’t come out,” says the troupe’s experienced leader of sorts, and of course they’re subsequently forced into said tunnel via some wall-shifting tomfoolery. You do get the sense that director John Erick Dowdle, who has experience in both found footage and claustrophobic horror with Quarantine and Devil, could have spent more time attempting to wear us out. The Descent is an obvious inspiration — there’s a clear homage moment towards the end involving a river of blood — and that film succeeds because it works exceedingly hard to get under the viewer’s skin. The Descent’s scare-factor isn’t necessarily born out of the arrival of its cave-dwelling beasts. It is scary because, no matter how vociferously you scream at the television, the people on screen are clearly going deeper into the abyss with no foreseeable way out. This film spends a bit of time conveying that trapped-ness effectively; the found footage aspect is a positive influence, enforcing a natural tightness that in most other cases would frustrate viewers. Although it tries hard to steer clear of jump scares — Dowdle and his co-writing brother Drew should be commended for avoiding that lazy route — it doesn’t hammer home the characters’ overarching struggle as well as The Descent. This might be to do with the frequent interludes of ancient word scrabble that are tonally hokey and encourage respite. For those who have seen The Borderlands, the same ‘corridor of uncertainty’ conclusion to that movie can be found spliced throughout As Above, So Below. Peculiarity is in the air, and Scarlett et al are often as unaware as we are regarding the strange events. Though the philosopher’s stone stuff is generally silly, when Dowdle strikes the correct balance between mysticism and realism the film takes a turn for the creepy. Objects that appear at random are unsettling not just because they’re in a place they shouldn’t be, but also because they’re in some way connected to the group. An errant piano has the same broken key as one of the party’s childhood instruments, a revelation wrought in subtle terror. The characters are secondary to the spooky goings-on which is an unfortunate genre norm. 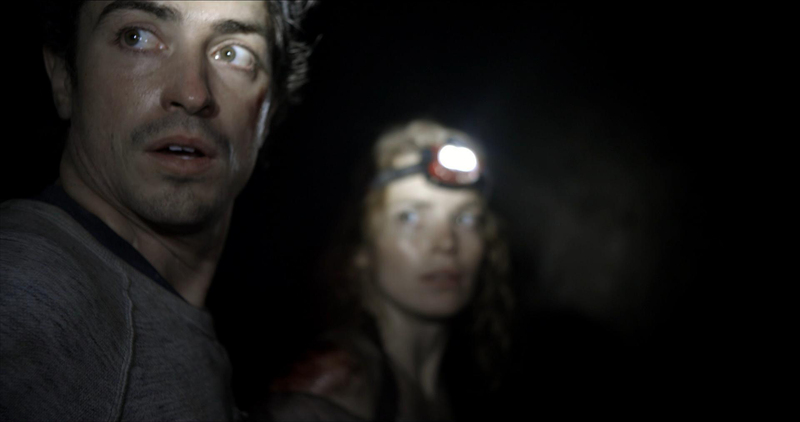 Perdita Weeks and Ben Feldman are fine if unspectacular as the ostensible leads, both amiable enough. Though, at times it does feel like the duo and their mates have watched too many generic horrors — events that should shock them don’t for some reason. Someone dies and Scarlett declares, “I can’t bring back the dead, sorry,” with the same nonchalant detachment a waiter would convey when apologising for the lack of tomato ketchup at his restaurant. People inevitably begin dropping like flies, which is fine. It is a horror movie after all and death is written in the Horror Movie Constitution. In a somewhat surreal turn of events, the ending manages to be both aggravating and refreshing. 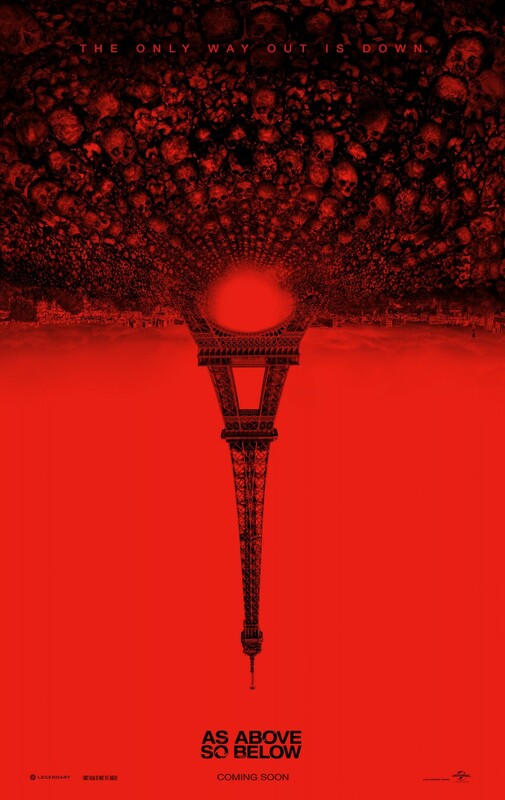 As Above, So Below starts off on shaky ground, stuck in a preparatory rut for longer that it ought to be. When the shaky ground finally is behind (or above) us, there’s a lot to like. Ha no worries man, I wanted to see what my comment was since it gets cut off in the sidebar thingy and I noticed on this post that you have assigned a star rating to it. Was that just a one-off thing? I’m currently in the process of adding stars to all my reviews (it’s taking a while). Even added a legend on the top right! Oh, right on man. I’ll take a peek now! Very cool. I liked it quite a bit. Very spooky and atmospheric. Yeah you’re right. I would’ve liked it to have been a little scarier, but this is far from a dud.